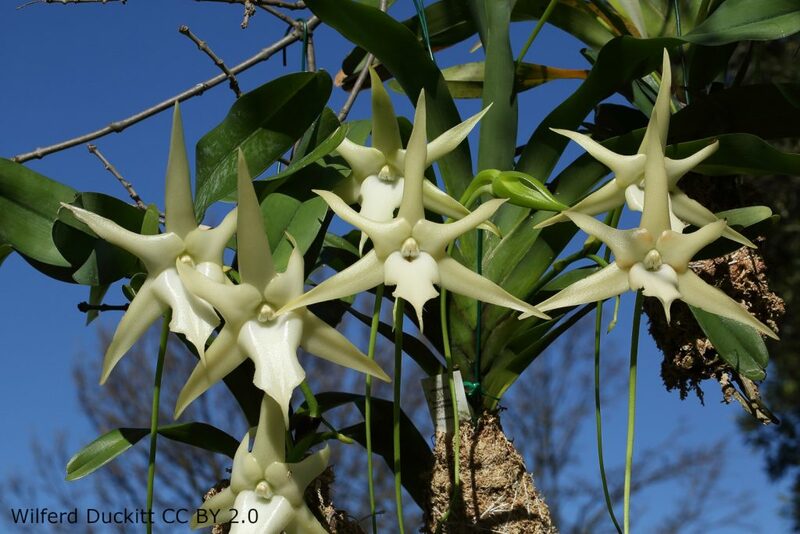 The wonderfully named Angraecum sesquipedale is also known as the Chritsmas orchid or Darwin’s orchid. It seems an appropriate plant to write about as it brings together a reminder of Christmas with the father of evolution, Charles Darwin, himself a Unitarian christian. It’s an orchid species native to Madagascar discovered by a French botanist, Louis-Marie Aubert du Petit-Thouars, in 1798 but not described as a new species until 1822. One of it’s most notable features is an extremely long nectar spur some 30-45cm long. 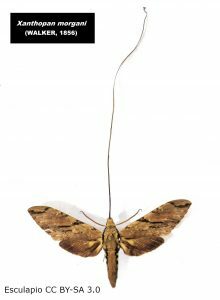 This lengthy nectar spurt caused Charles Darwin to predict there must be a pollinating moth with a proboscis of matching length. Sadly the moth was not discovered until 21 years after Darwin’s death in 1882. The discovery of the moth was seen as support for Darwin’s theory of evolution. So we have a brief version of why this plant might be known as Darwin’s orchid, but why is it also known as the Christmas orchid? That’s a consequence of Madagascar being in the Southern hemisphere but a lot of orchid growers being in the norther hemisphere. In the wild, this species flowers in June/July (mid winter – as far as that is relevant to Madagascar) but when it’s brought to the northern hemisphere it flowers in December/January and is frequently in bloom for Christmas. This orchid is reportedly quite easy to grow if you get the conditions right – 18-25C day and 10-15C night, a very well drained coarse bark growing medium,50-70% releative humidity, good air circulation and regular watering… so perhaps not an ideal windowsill plant for most of us! This is lowland tropical wet. If you have the conditions then the flowers of this plant are reputed to have a very good scent at night – something I can’t tell from photos. 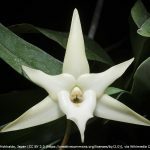 This entry was posted in Advent, Herbarium RNG, Public Engagement with Science and tagged #AdventBotany, #AdventBotany2018, Christmas orchid, Darwin's orchid, Star of Bethlehem orchid. Bookmark the permalink.